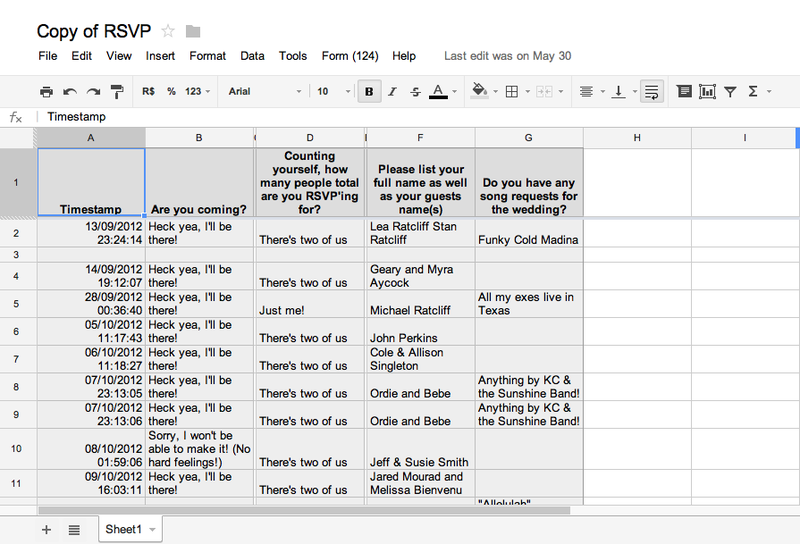 Even though our wedding was a bazillion months ago, I've been wanting to write a post on our RSVP method. Now, I'm not the best at writing how-to blog posts, and I'm also not the best at explaining technological things, so consider yourself warned. 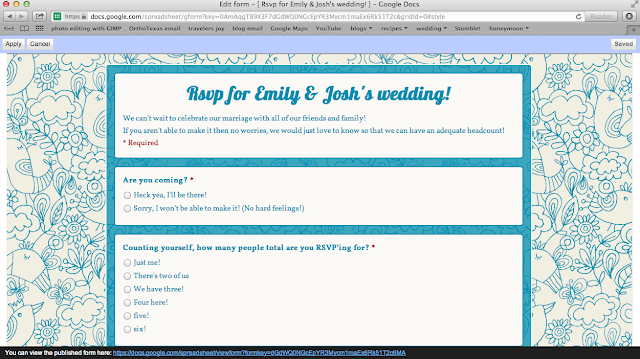 For our wedding, I thought I would take advantage of my own little space in the world wide web and allow our guests to RSVP via my blog. Saved us tons of money of stamps, and made it quite easy for everyone who knows how to work a computer. 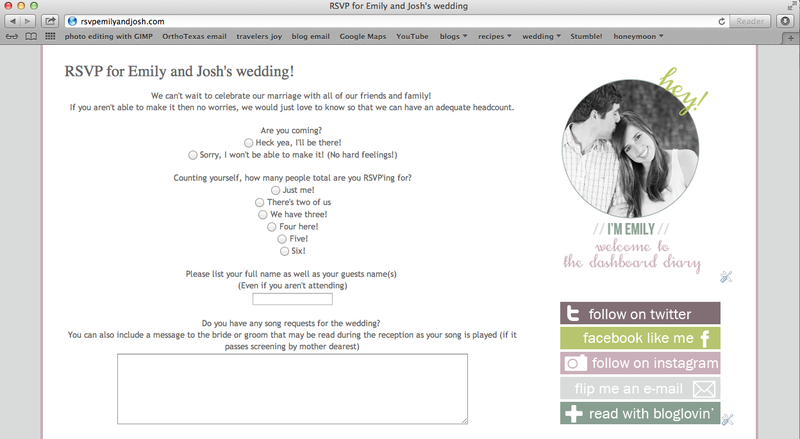 The main reason we wanted to do a digital RSVP was so that our guests could request a song for the wedding (and even include a message to Josh and I) that may or may not be read out loud by the DJ (if my mom deemed it socially appropriate). 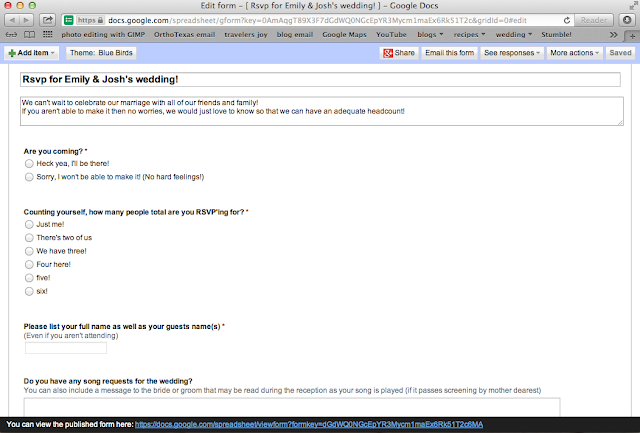 GoogleDocs provided the perfect platform for me to make a custom form for the guests. 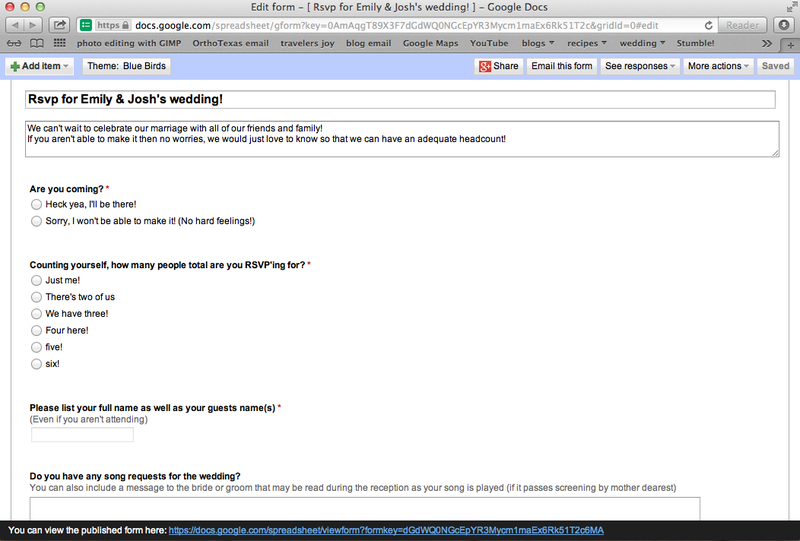 I bought a generic domain name (RSVPEmilyandJosh.com), and incorporated the HTML for the google form into a seperate page on my blog. 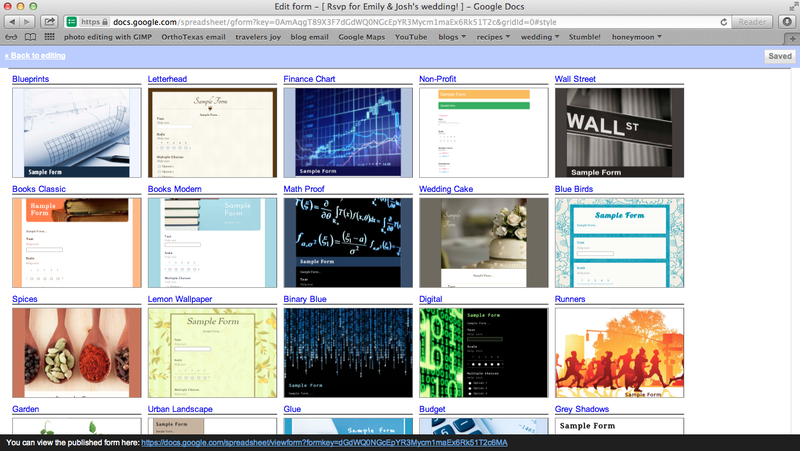 www.Docs.Google.com will be your starting point so that you can choose the generic layout for your form. I chose the form "Blue Birds"
The next page allows you to edit each question, and you can also customize the heading and the options listed below the questions. You have plenty of choices for responses to your questions like checking items from a list or allowing responders to freely type in a response box. See the little hyperlink at the bottom of the photo above that says "You can view the published form here"? Now, if you are happy with your form you created you can skip this next step. For some reason GoogleDocs wouldn't let me include hyperlinks. Somehow I got the HTML (website code) from the google document and copied and pasted it into my blog formatting, but for the life of me, I can't remember how. If anyone has any really awesome technological advice then that would be fantastic and I'd gladly insert it here for people who want to incorporate their custom document into their personal blog format. 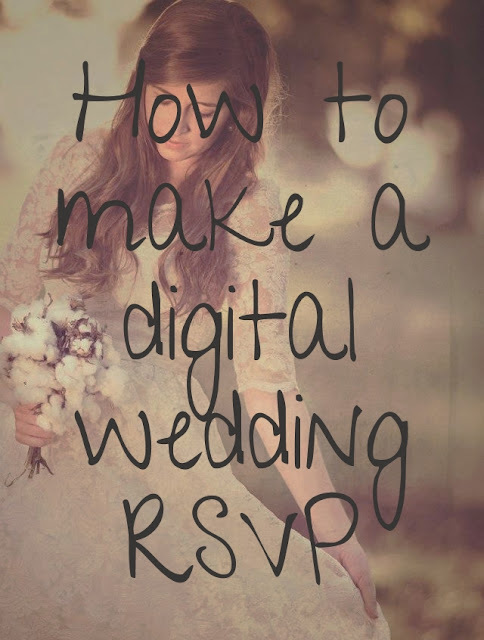 If you like the look of the original form you created via GoogleDocs then you can definitely keep that format, rather than incorporate it into your blog, like I did in the above photo.
. . . and you definitely don't want that jumbled wad of letters and numbers on your wedding invitation. This will let you guests be automatically directed to your RSVP form just by typing in the simple domain name you bought. Now, when it comes to receiving your guests information. . .
All of that is conveniently and automatically sent to a very well organized google excel chart which you have access too from the docs.google.com homepage. If you have any questions about how I did it (because I know that was probably the worst explanation ever), feel free to email me at emily@dashboarddiary.com and I'll do my best to assist you! To see more about our wedding, you can go here! So creative! I think I'd still send out traditional invitations, but have them RSVP online via something like this if I eventually get married. google chart already made! mind blown. such a smart idea. Such a clever idea. Wish I had thought of this a few months ago -- I loved the print invitations and RSVPs we went with (they were from PaperSnaps.com) but man, are people rruuuddeee!! This is a full-service, top notch venue with amazing food and liquor, without the cookie cutter atmosphere of a traditional wedding venue. It's so a lot of excited regarding the marriage one amongst my friend however very little tense regarding the marriage favors. awing post! it's sensible to pay additional hours for your wedding. arrange your wedding slowly and steady. Tunesday: The Head & The Heart "Shake"
We got a new brother-in-law! Tunesday: Passengers "Let Her Go"
Tunesday: Edward Sharpe "Life is Hard"
Time for another fantastic giveaway! Shakespeare via Dave Matthews: "Come Away"